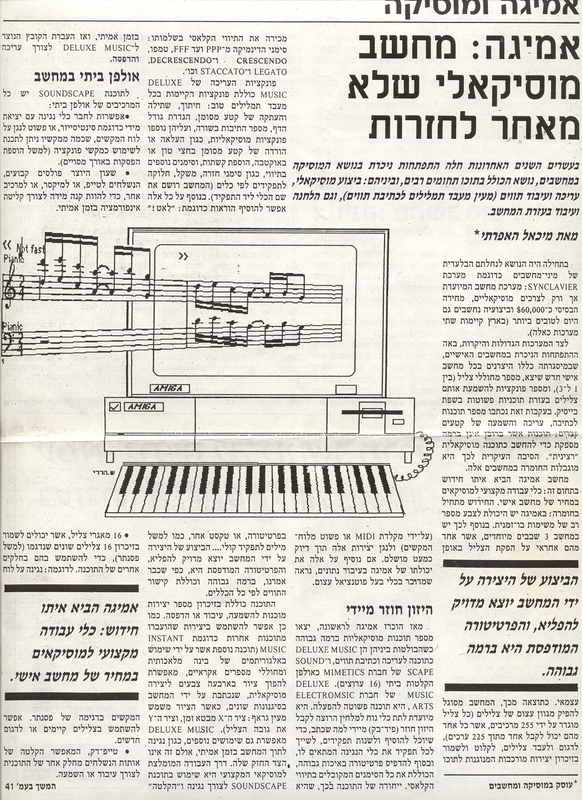 On 1986 I published my first professional article about using computers to compose music. 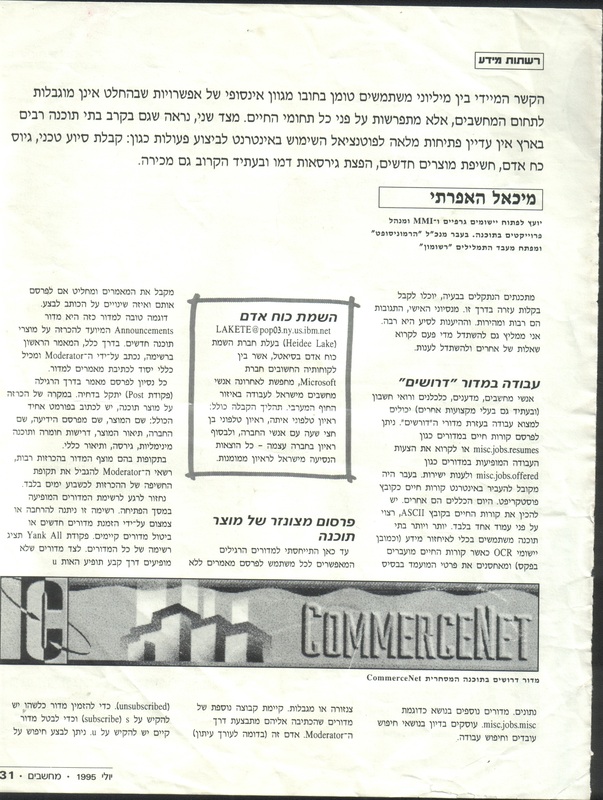 It was published in People and Computers, “32 Bit” magazine. 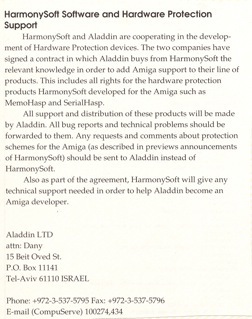 AmigaHASP was developed as an independant product to protect Rashumon, my word processor. Eventually sold the entire product to Aladdin. 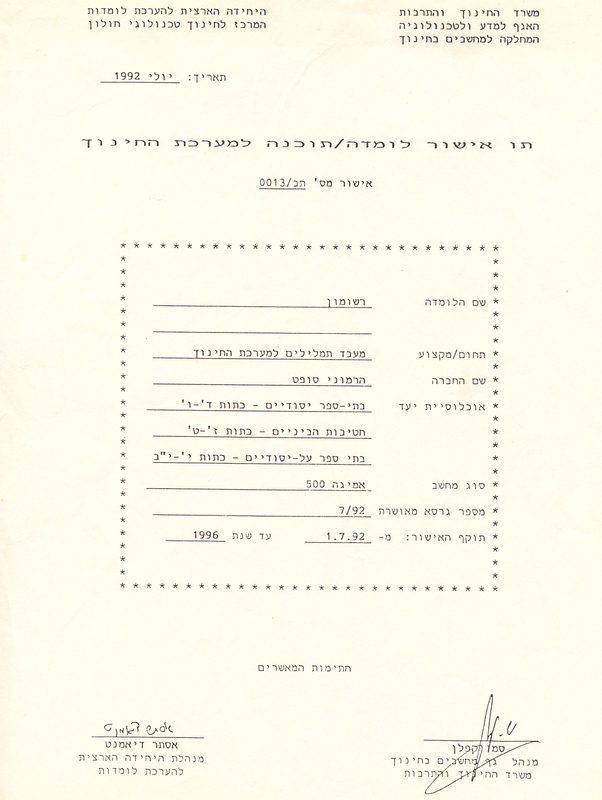 Certificate TN/0013 for Rashumon, after being tested by Dr. Amnon Til, for the Israeli Ministry of Education. 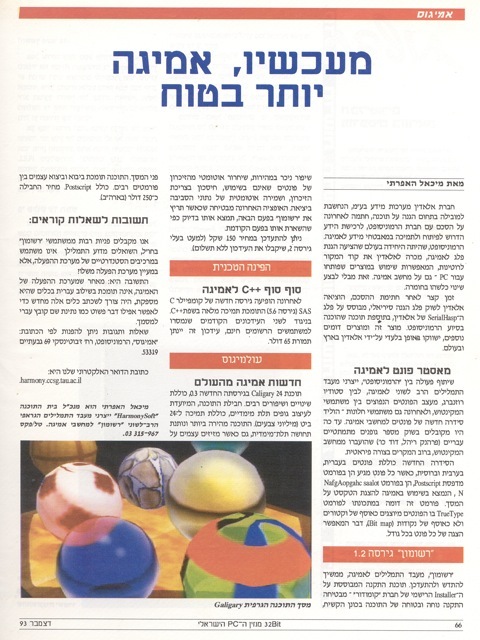 An article published at Amiga World on May 1994. A new word processor for Amiga computers, by Commodore, has launched. The word processor, Rashumon, was developed by HarmonySoft, and it has the ability to read out loud the text (currently only in English). It is a multi-lingual word processor which enables typing and editing in various languages, using miltiple fonts and colors. 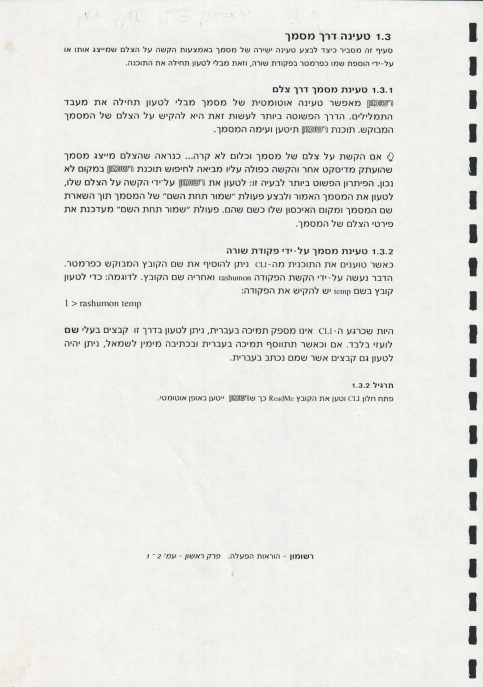 The typed documents are printed exactly as shown on screen, like with Macintosh computers. 8 colors can be used simultaneously, chosen from 4096 available colors. Text can be highlighted in Bold, Italics and underline. 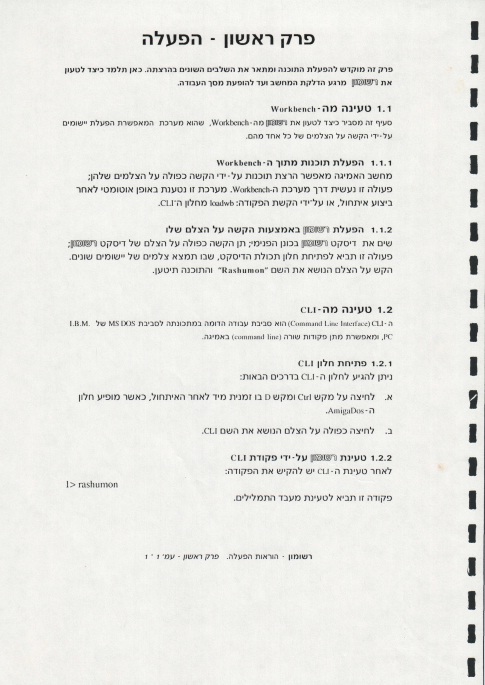 Here is a screenshot of Rashumon, the multi lingual graphic word processor for the Amiga. 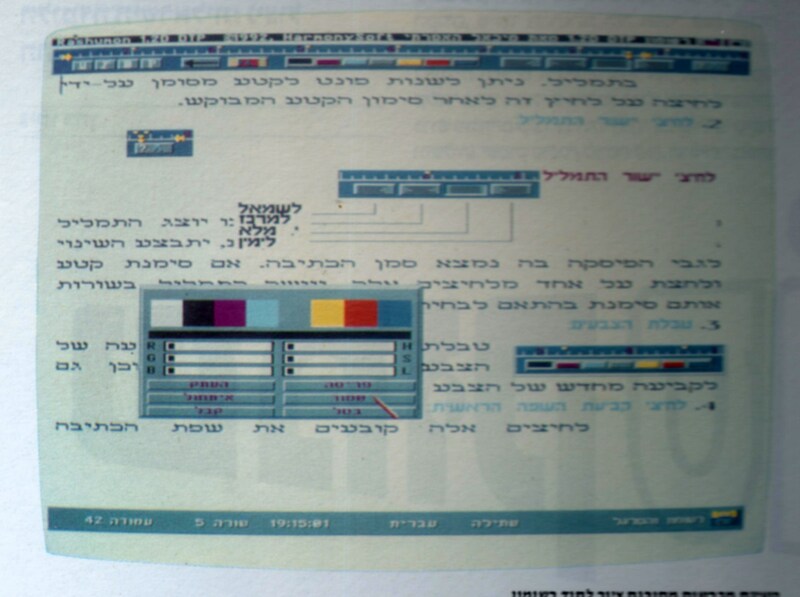 Sub title: a graphic multi-lingual word processor for Amiga computers. 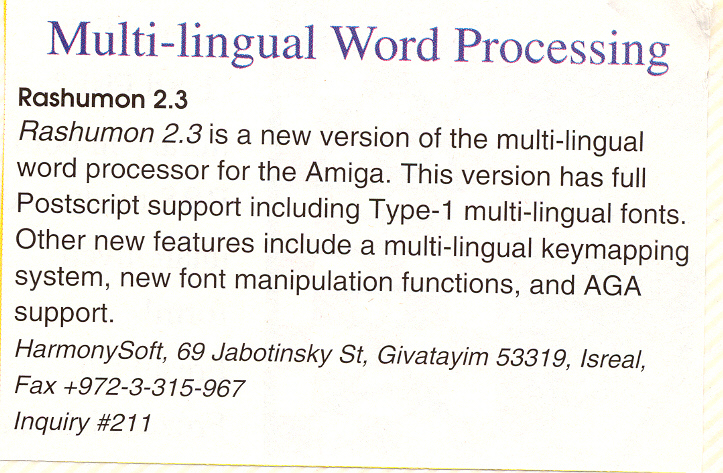 After a development period of a year, a graphic multi-lingual word processor for the Amiga was announced. 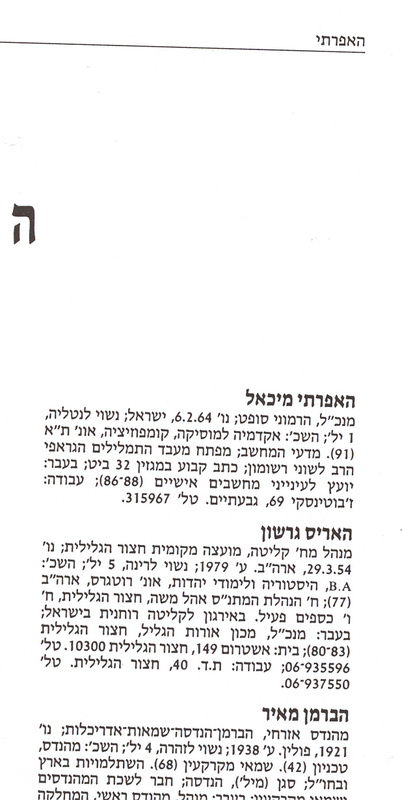 The word processor, developed by Michael Haephrati from HarmonySoft, allows typing and editing of text using multiple fonts, (including proportional spacing fonts). 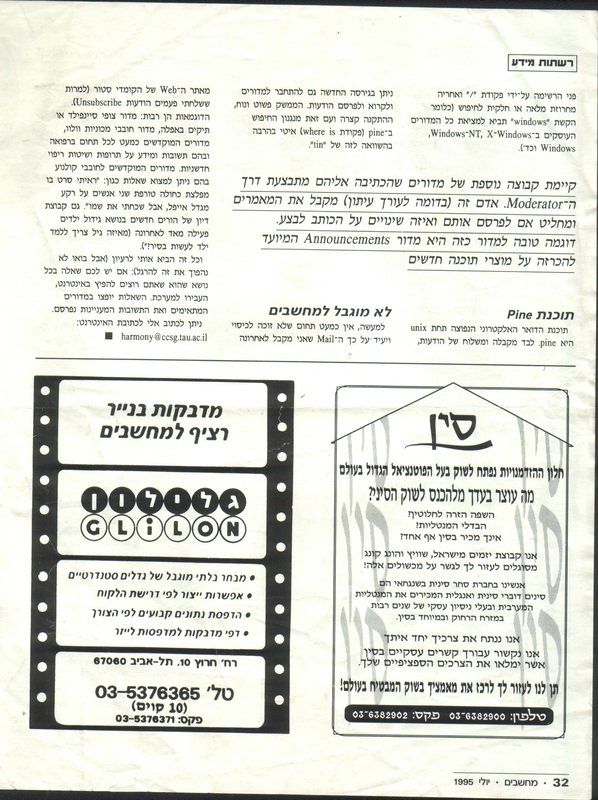 The text which is displayed as WYSIWYG can be printed with 8 colors, bold, italicize and underlined. The text can then be exported to other graphic software or saved in ASCII format, including a file compatible with PC format. 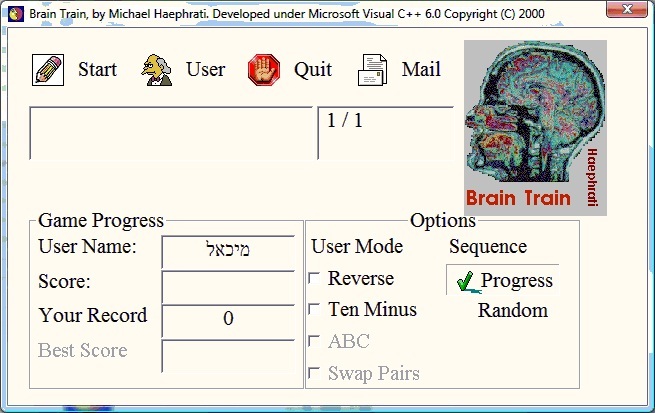 Rashumon includes the feature of sophisticated searching and replacing, automatic save, math calculations and … reading the English text loud by the computer. The user interface Rashumon has is intuitive while the end user controls the word processor both with the keyboard and the mouse. Scroll bars, (operated by the mouse or the keyboard), which are part of the user interface, updates the data displayed, in real time. Buttons are used to turn on and off various features and for displaying information about the attributes of the text. Text Edit boxes support proportional fonts and allow performing changes on selected text which can contain fonts of various sizes, colors and styles. 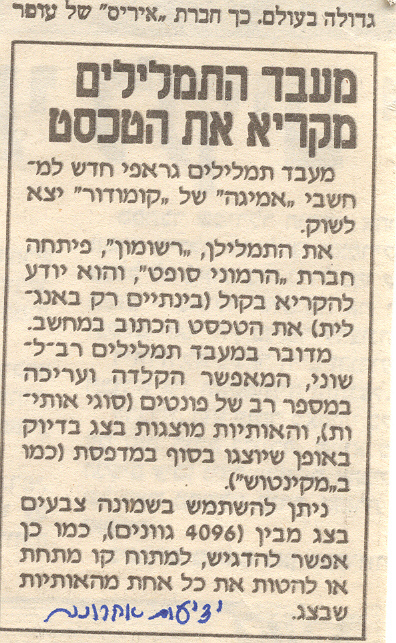 Rashumon allows selecting an unlimited number of portions of the text and perform on them actions simultaneously. As for being easy to use, the various buttons are designed in 3d and it is easy to determine the function of each button even without looking at the user manual. As a multi-lingual word processor, Rashumon can combine text in two languages properly; each line can be chatarterize separately based on its main language. One of the original new features Rashumon has is the ability to select with the mouse one or more parts of the text and ask the computer to read them loud. Many Amiga users are probably aware of the Amiga ability to perform artificial speech from the demo program (DEMOS). Now, a text reading routine was developed for Rashumon to read out load the text in an almost “human” voice. Thanks to the unique characteristics of the Amiga, the selected text/s are translated into phonetic syntax which are converted by a unique library into number which represent digitally (much like a CD player) the required sounds producing the artificial speech. These sounds are sent, using an Analog to Digital converter to the 4 sounds channels of the Amiga. 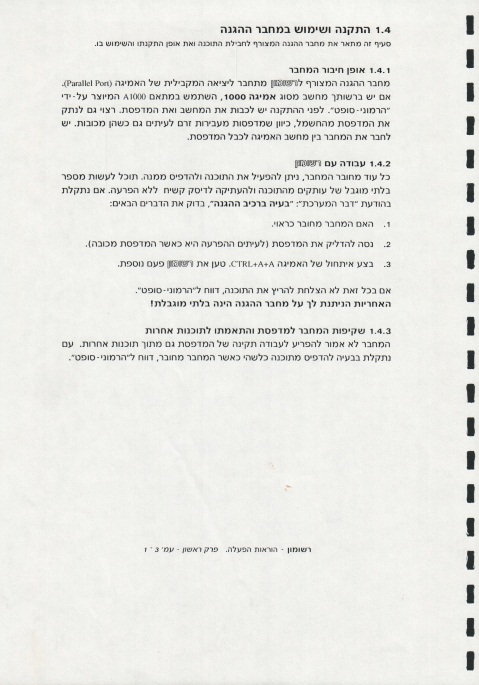 This routine reads the text according to its logical order and not just right to left or left to right. 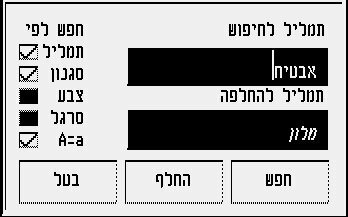 For the time being, the text reading function in the current version of Rashumon is limited to Latin text or Hebrew text written in Latin characters (the word “שלום” should be typed as “shalom”). 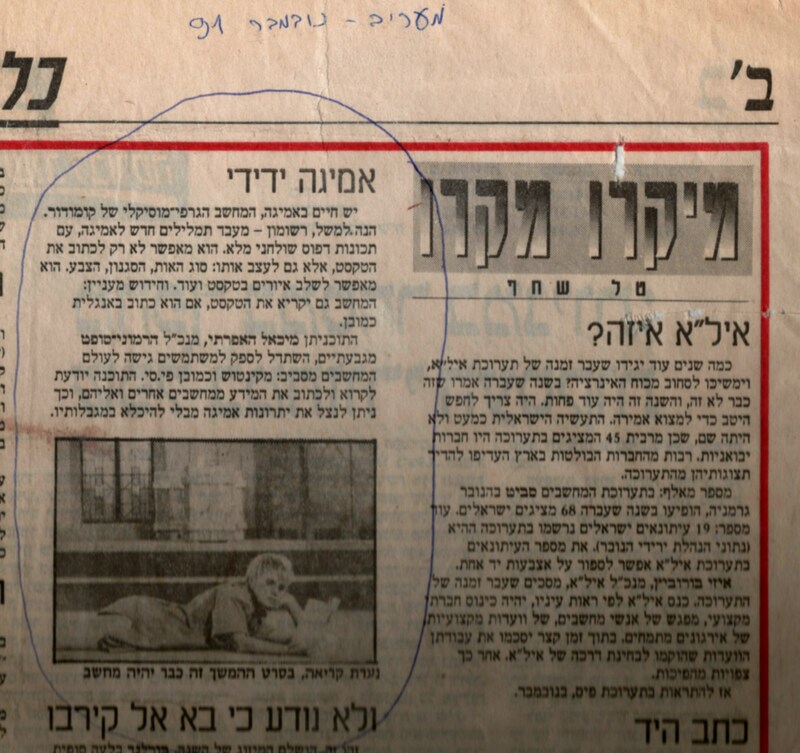 In the next version it will be possible to read Hebrew text as well, that thanks to another routine which is now in advanced development stages. This routine, using artificial intelligence will “select” the appropriate Pronunciation which suits best any problematic words that are spelled the same but are pronounced differently. There are life in the Amiga, the graphic-musical computer by Commodore. 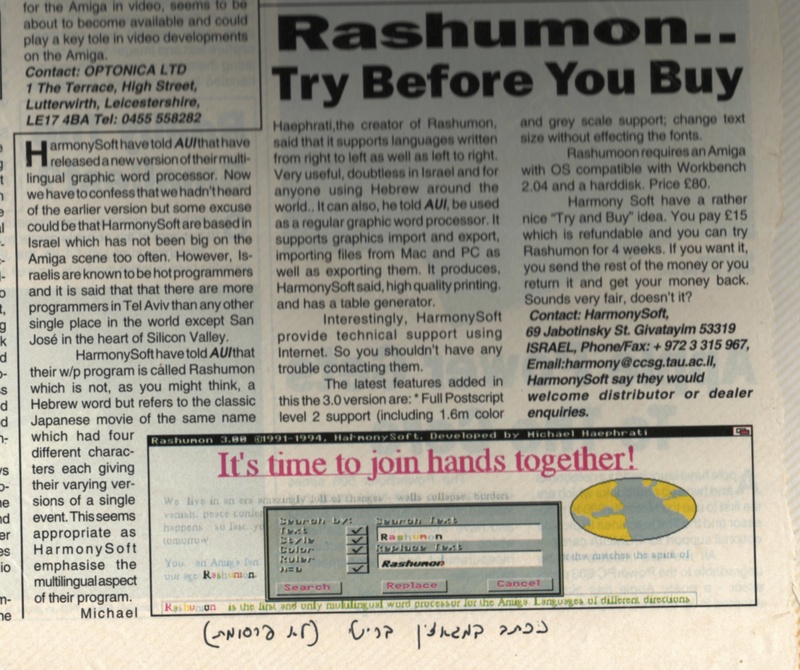 Here, for example, Rashumon – a new word processor for the Amiga, with full desktop publishing features. It can allow not only typing the text but also to style it: font type, style and color. It allows combining artwork with the text and more. 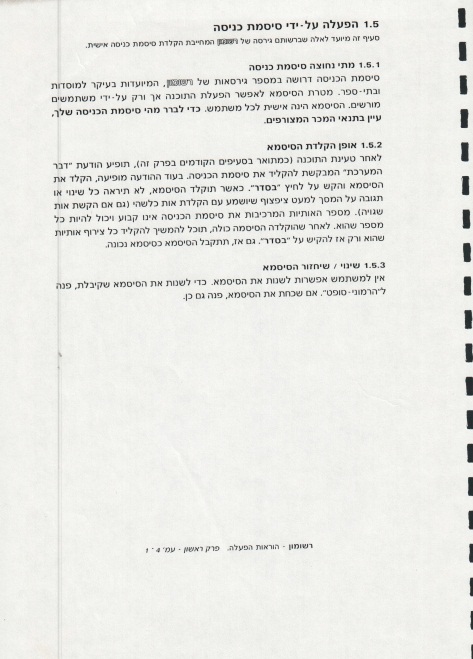 An interesting renovation: the computer will also read out loud the text, provided that it is typed in English of course. 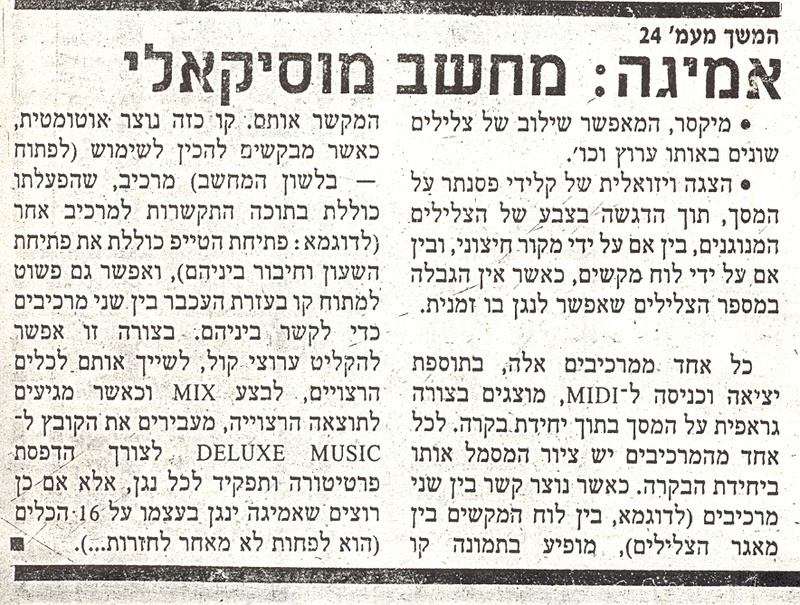 The developer, Michae Haephrati, CEO of HarmonySoft, from Givatayim, did his best to provide the end users an access to the world of personal computers, such as Mac and of course PC. The software is capable of importing and exporting the data from other computers to to them. It is now possible to take advantage of the unique qualifications the Amiga has without being imprisoned in its limitations.